La tumba de Sīdī Aḥmad al-Tiŷānī (¡Dios altísimo esté complacido de él!) reúne y une a los africanos. 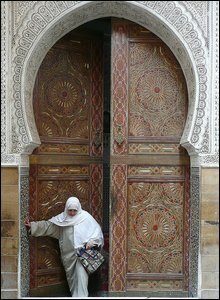 The 12-centuries-old city of Fez is known as Morocco's spiritual capital, but it also has huge relevance for millions of West Africans. They come in droves - from Senegal, Mali, Niger and Nigeria - to worship at the tomb of a North African holy man, Sheikh Ahmed Tijani. Senegalese men in flowing twilight blue Boubous mingle with Moroccans in hooded Djellabas at the impressive gate of the Zaouia, or religious centre for the Tijani brotherhood, in the narrow and winding streets of Fez's old town. 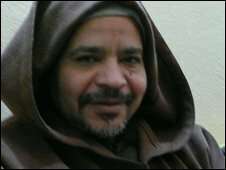 Sheikh Tijani, who was born in Ain Madhi in what is now Algeria, is reputed to have learnt the Koran by heart by the age of seven, and given his first fatwa (religious instruction) at 15. He founded the Sufi brotherhood at the end of the 18th Century - using the Gregorian calendar - or towards the start of the 13th Islamic century. Muslims flocked to hear the teachings of the holy man, who had spent long periods meditating in the Sahara Desert. The Moroccan sultan of the time, Moulay Slimane, supported Sheikh Tijani, aiding his rise. Tijani disciples from neighbouring countries spread the word and now there are millions of his followers in West Africa. "I have visited many African countries, and there are villages and towns where you don't expect to find even a sign of civilisation, but you find a Koranic school and other buildings put up by the Tijanis," says Zoubir Tijani, a descendent of Sheikh Tijani, who looks after his mausoleum. "Secondly, our brotherhood sticks very closely to the Koran. "Sheikh Tijani said if you hear me say something which contradicts what the prophet says, you must ignore it. "This message appeals to people, so if you go into the Zaouia now you will find more than 12 nationalities. "In this brotherhood you find all sorts - ordinary people and ministers." The former Senegalese Prime Minister, Moustapha Niasse, comes from a famous Tijani family, and Hissen Habre, the former dictator of Chad, is a Tijani. Zoubir Tijani brushed away suggestions that Mr Habre, who is accused of numerous human rights abuses, had clearly found it difficult to follow the Tijani message of peace. Tijanis, both well known and anonymous, come to Fez to pray at Sheikh Tijani's tomb, often on their way to Mecca, explains Abdellatif Begdouri Achkari, a Tijani, and a senior member of Morocco's Islamic affairs ministry. "Islam came to West Africa from Morocco, so it's normal there is such a strong spiritual relationship," he said. 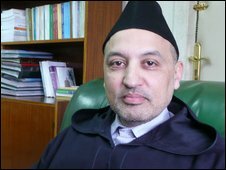 "Sheikh Ahmed Tijani is a great figure in Morocco, and the links we have with people from other countries are not political, they are spiritual." Round the corner from the Zaouia, Sheikh Tijani's last resting place, a small community of Senegalese people live. Samba Thiam moved here nine years ago, thanks to his faith. He rents a room in a traditional two-storey Fez house, and helps other Tijanis who come to pray at the grave of the Sheikh. "I came here because of the Zaouia of Sheikh Tijani," he says in halting French mixed with words of Wolof and exuberant English. "I live here near the Zaouia to welcome and help the disciples. They come from all countries in the world, and there are lots of them - sometimes we have as many as 30 in a week." Later he and other Senegalese, two of whom have come from France, sit down for lunch in the Senegalese style, using their hands to eat from a common dish. Many of these pilgrims contribute to the upkeep of the Zaouia. "Disciples of the Tijani brotherhood provide everything that is necessary here - they pay for water and electricity, carpets, everything that is needed," explains Zoubir Tijani. "They aren't obliged to, but they do it to make everyone feel at ease." 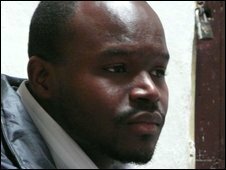 Habib Diallo, a Senegalese student in Fez, is a regular visitor to the Zaouia. He and other Senegalese meet on Thursday evenings to chant Allah's name, to prepare themselves for the Friday prayer. He says the fact so many Senegalese are Tijanis has contributed to the close relationship his country has with Morocco. "The Moroccans respect us because we are disciples of Sheikh Ahmed Tijani," he says. "It's a very big advantage. "Everyone knows there is a very nice relationship between Senegal and Morocco, and Sheikh Ahmed Tijani is at the centre of that."